Donkey Gods, 2018, oil paint, acrylic paint, enamel paint, vinyl paint, mirror, concrete cement, hair weave, beard weave, screws, Plexiglas, inkjet prints, pegboard, school desk chairs, Doc Martens, sneakers, socks, LED rope lights, paint brush, canvas, Newports, blunts, fake plants, green foam blocks on school desks, digital video, tablet computer, 106 x 200 x 31 in. Photo: Robert Wedemeyer. Image courtesy of the artist © Aaron Fowler. 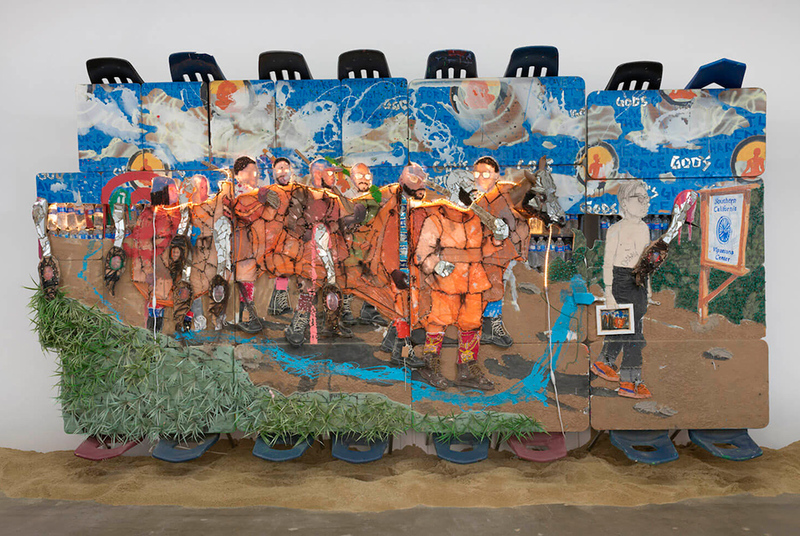 SEATTLE, WA.- The Seattle Art Museum announced the selection of mixed-media artist Aaron Fowler as the recipient of the 2019 Gwendolyn Knight and Jacob Lawrence Prize. Major funding for the prize is provided by the Jacob and Gwendolyn Knight Lawrence Foundation. Fowler will receive a $10,000 award to further his artistic practice, and his work will be featured in a solo exhibition in SAMs Gwendolyn Knight & Jacob Lawrence Gallery in fall 2019. Based in Harlem, Los Angeles, and St. Louis, Aaron Fowler makes large-scale sculptural assemblages composed of a wide range of found materials. With references to American history, Black culture, and real and imagined narratives, each work is densely layered with meaning and materiality. From ironing boards and car parts to hair weaves and videos, Fowlers work is imbued with multivalent narratives that compel the viewer to take their time looking. Employing compositional approaches akin to 19th- and 20th-century American and European paintings, Fowler references family, friends, and himself in works that are at once universal and deeply personal. Aaron Fowler (b. 1988; St. Louis, MO) received his MFA from Yale University School of Art in 2014 and his BFA from the Pennsylvania Academy Fine Arts in 2011. He was an artist-in-residence at the Skowhegan School of Painting and Sculpture in 2014 and was the recipient of the Rema Host Mann Foundation Emerging Artist Grant in 2015. Fowler has exhibited throughout the United States and abroad, including shows at Saatchi Gallery, SCAD Museum of Art, The Rubell Family Collection, Beeler Gallery, Columbus College of Art and Design (solo), Diane Rosenstein Gallery (solo), and the Studio Museum in Harlem. He lives and works in Harlem, Los Angeles, and St. Louis.